Obesity is a global health problem affecting all age groups, leading to many complications such as type 2 diabetes, systemic hypertension, cardiovascular diseases, dyslipidemia, atherosclerosis, and stroke. Physiologically, obesity which arises from metabolic changes at tissue and organ levels results in an imbalance between energy intake and energy expenditure, which in turn results in increased fat accumulation in adipose tissue. Adipose tissue is an important endocrine organ, which secretes several hormones, including leptin and adiponectin and chemokines. These factors can regulate tumor behavior, inflammation, and the tumor microenvironment. Excessive adipose expansion during obesity causes adipose dysfunction and inflammation to increase systemic levels of pro-inflammatory factors. Cells from adipose tissue, such as cancer-associated adipocytes and adipose-derived stem cells, enter the cancer microenvironment to enhance pro-tumor effects. Dysregulated metabolism that stems from obesity including insulin resistance, hyperglycemia, and dyslipidemia can further affect tumor growth and development. Two different obesity treatment drugs are currently on the market: orlistat, which reduces intestinal fat absorption via inhibiting pancreatic lipase, and sibutramine, an anorectic or appetite suppressant. Both drugs have side effects, including increased blood pressure, dry mouth, constipation, headache, and insomnia. For this reason, a wide variety of natural materials has been explored for their obesity treatment potential. 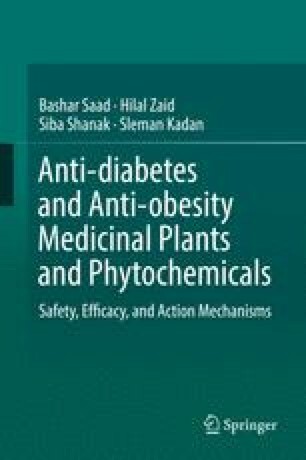 The present chapter focuses on the safety and efficacy of commonly used herbal medicines in the management of obesity through covering their beneficial effects and mechanism of action.